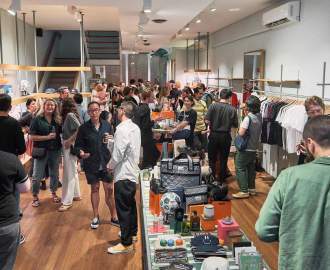 The Hugos Kings Cross space as been reborn with a new concept. Sydney lost a long-time legend of the Kings Cross nightclub scene when Hugos closed its doors back in 2015. But when locals banded together to revitalise the area's nightlife, the space was reborn as Flamingo Lounge, courtesy of the team behind Double Bay's now-closed Casablanca Bar and Restaurant. And yes, Sneaky Sundays are back. Flashing a brand new Miami-inspired fit-out along with a 3am license and late-night pizza offering, the venue was initially intended to be a pop-up. But the team — who closed Casablanca earlier this month — has decided to go full steam ahead and make it permanent. "We knew we'd have to close Casablanca [due to commercial development] and this was the best venue to buy because of its position and history in Kings Cross," managing partner Poata Okeroa told Concrete Playground back in June. "The space is a progression from Casablanca for us." The new digs are decidedly different from Hugos, going for a 1980s vibe that combines Miami glamour with art. Think pink neon lights, a retractable DJ stage, plush lounges and mixed-media wall collages. "The artwork and ceiling details pays homage to the art walls of downtown Miami," explained designer Josh Clapp. "The lighting has a bit of Las Vegas and Caribbean flare, but we're moving away from that 'New York speakeasy' vibe you see everywhere." The space has been designed to be much moodier and darker than Hugos, with deep shades of burgundy acting as the main colour scheme. The entire venue has also been expertly soundproofed to make the internal sound quality top-notch — plus it has the added benefit of keeping the peace with neighbours. As a small homage to the venue's past, the leather from the existing lounges of Hugos has been repurposed as ceiling and wall panels. While the main club is meant to focus on the DJ booth, the adjoining terrace bar offers a more sophisticated cocktail lounge with table service and secluded booth. In all, the Flamingo Lounge will house four bars, and host three distinct nightly offerings. 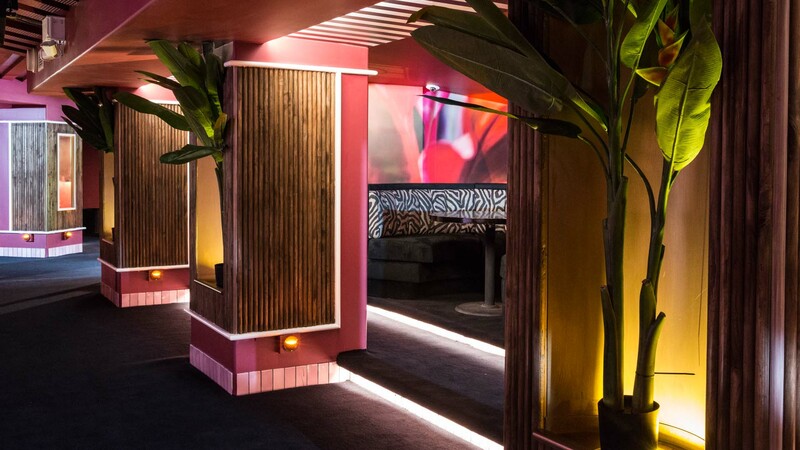 Flamingo Fridays will be lead by former Backroom and House of Luis Tans owner Raul Gonzales, and feature house music inspired by 1980s classic Miami disco glamour. Flamingo Saturdays will take their cues from Casablanca, with a bottle service-driven offering accompanied by hip hop and R&B. Finally, Sneaky Sundays — complete with Connie Mitchell and Black Angus — will make a triumphant return to Bayswater Road on the last night of the week, from 8pm till late. This will launch on October 1, which is on the Labour Day weekend. "We are extremely excited to be the ones pioneering the area post lockouts," said co-owner Sid Pierucci on the eve of Flamingo Lounge's launch. "Potts Point has always been a hotspot — arguably the epicentre — of Sydney's nightlife. Since the lockouts back in February 2014 the area's overall demographic has significantly altered the character of the area which is now needy of an upper class late night venue. We ultimately hope to add vibrancy to a city that currently needs it." Flamingo Lounge will soon be joined by Chula, a new Mexican restaurant from the Barrio Chino team, that will open next door before the end of the year. Words: Marissa Ciampi and Tom Clift. Images: Letícia Almeida.